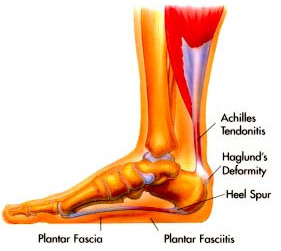 Are you suffering from Achilles Injury? Not being able to walk normally and tip-toeing? You are at the Right Place. 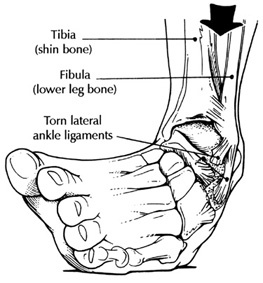 Get immediate treatment on your Achilles Injury today. Call +65 64712744 or SMS to +65 92357641 for Appointment. 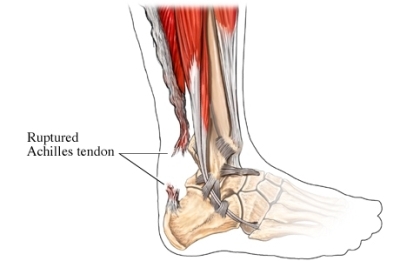 A total rupture of the achilles tendon is a complete tear of the tendon and typically affects men over the age of 40 involved in recreational sport. 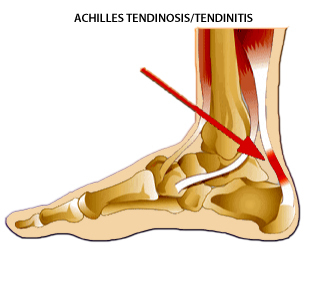 A complete rupture of the achilles tendon is not always recognized at the time of injury, however it is very important it is treated properly as soon as possible to increase the chances of a good recovery. Symptoms include a sudden sharp pain in the achilles tendon which is often described as if being physically struck by an object or implement. A load snapping noise or bang may also be heard at the time. A gap of 4 to 5 cm in the tendon can be felt which may be less obvious later as swelling increases. After a short while the athlete may be able to walk again but without the power to push off with the foot. There will be a significant loss of strength in the injured leg and the patient will be unable to stand on tip toes. There may be considerable swelling around the achilles tendon and a positive result for Thompson’s test can help confirm the diagnosis. You can expect to be out of competition for 6 to 9 months after achilles tendon surgery. This is increased to 12 months if the ankle is immobilized in plaster instead of operated on. There is also a greater risk of re-injury if you do not have the surgery. A complete rupture of the achilles tendon is a serious injury and rehabilitation should be a very gradual process taking 6 to 9 months. The following guidelines are for information purposes only. We recommend seeking professional advice before attempting any self treatment. To allow the tendon to heal, reducing pain swelling and inflammation. To restore the tendon and muscles to their original flexibility and strength. To gradually return to normal activity and training levels. There are two methods of treatment; surgical and non surgical or conservative. The speed at which a patient can progress with the rehabilitation will vary and should at all times be done under the supervision of a qualified professional. The timescales indicated below are only a rough guide and you should always take the advice of your consultant. 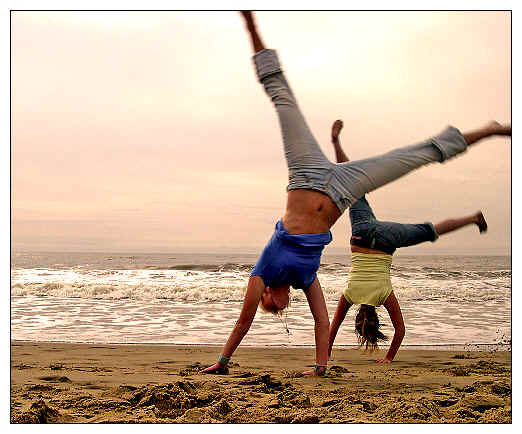 The surgical approach is usually the preferred one, especially for young and active people. Immediately following injury the principles of PRICE should be followed which are protection rest, ice, compression, elevation. Go as soon as you can to a sports medicine professional or accident and emergency unit. Surgery will usually be performed within 48 hours or as soon as possible. This will follow a similar pattern to that of the surgical approach although will take a lot longer. A plaster cast will be applied in a plantar flexed position (toes and foot pointing down). Sometimes after four weeks this may be altered to allow less plantar flexion. After 8 weeks the tendon is usually healed. A plaster cast is applied after surgery. No stretching or exercise, just let it heal. You may be able to work the upper body. Try to do something positive, it will certainly help your state of mind. Stage 1 – range of motion and flexibility. Place heel raises (1-2cm) in the shoes to take some of the pressure off the achilles tendon. 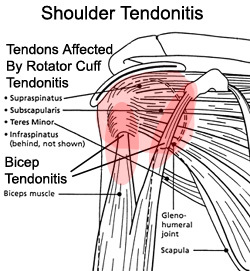 Sports massage techniques and ultrasound can aid in this process by helping to realign the new fibres in line with the tendon. Active stretching. Pull your toes upwards to stretch the achilles tendon. Very gently at first and gradually build up. If active stretches produce no pain then passive stretches can commence. This involves someone or something assisting in the stretching process. When a full range of motion has returned (the ruptured leg is as flexible as the other leg) then a gradual strengthening programme can start. Balance exercises should also be introduced as the sense of balance and positioning is often decreased after tendon or ligament ruptures and if not re-gained, can lead to future injuries. Wobble boards (balance boards) are great for this. Sports massage can play a part in the rehabilitation of this injury by improving blood flow to the area, helping the muscles relax and become more supple. Stage 2: Strengthen the achilles tendon and calf muscles. Great care must be taken when commencing a strengthening programme. There is a fine line between strengthening the tendon and re-injuring it. You can start strengthening exercises as soon as they can be tolerated. It may be a full month after the cast comes off before exercises can begin. The athlete may feel a little pain when you first start these exercises. If the pain is intolerable then do not continue. Gradually each day the pain should be less. The athlete should not attempt to increase the level of exercise until there is no pain during or after the exercises. The strengthening exercises must be done after a gentle warm up and stretch. The muscles can be warmed up by raising the heels up and down on the toes while seated. Heat applied directly to the tendon for example by a hot water bottle can also help. Flexibility training must be continued throughout. Remember to apply cold therapy or ice after exercise, this will help keep inflammation down. Avoid explosive or ballistic movements or this may lead to a re-rupture. When the patient has gone at least a week without pain then they may begin to return to training. If they feel pain when returning to training then stop. Begin each training session with a walk to warm up followed by stretching. How long until I am back to full fitness? Most athletes can expect to be out of competition for 6 to 9 months after surgery. This is increased to 12 months if the achilles was immobilized in plaster instead of operated on. There is also a greater risk of re injury if the athlete does not have the surgery.